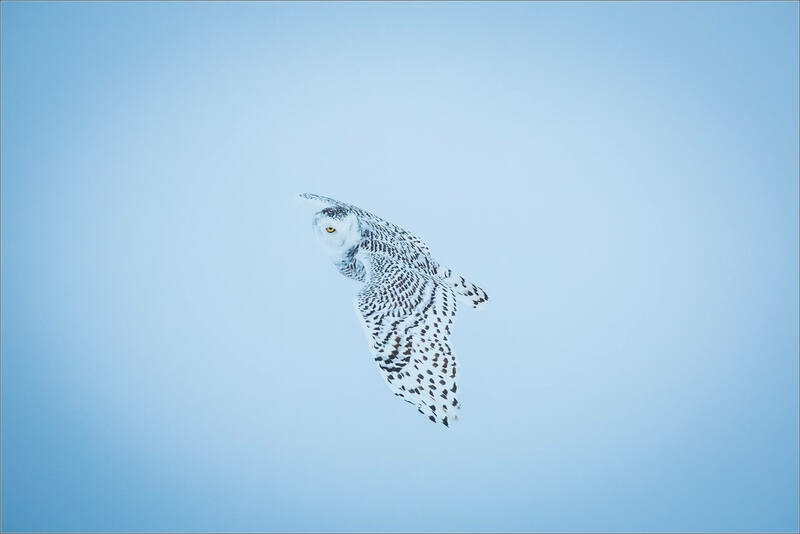 I started a morning last weekend watching a snowy owl. When she had a long yawn, that seemed like a good sign to keep moving. I left the napper and headed along a range road which ran due north. 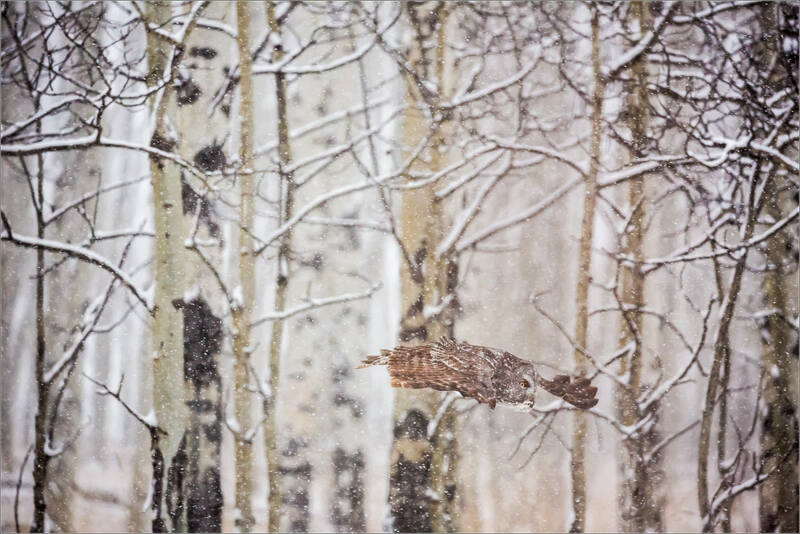 After a few miles, this owl popped into view as it flew out from behind a small bush. Happily, it wasn’t too upset by the disturbance and landed about 100 metres to the east. I took a few photos from the roof of my car and then pulled out my longest lens (500mm) and the monopod as it felt like I had time before he might start hunting again. 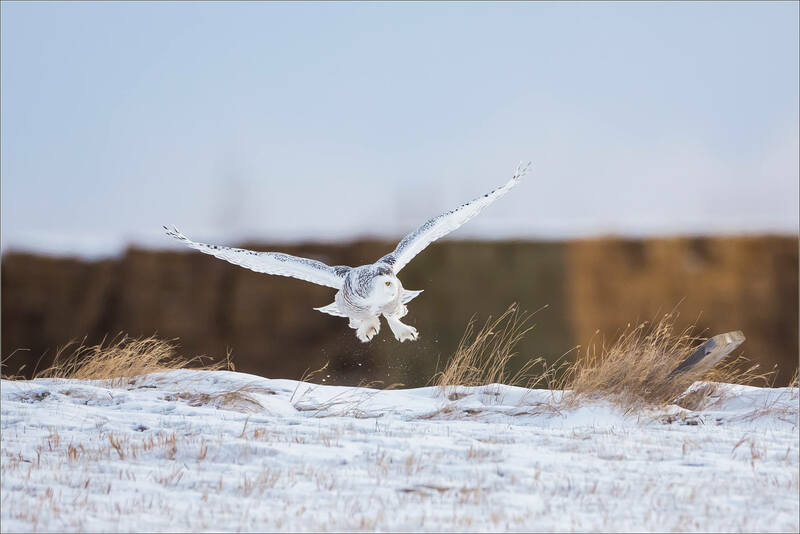 That started a great 90 minute stretch where I was able to move into good positions (the owl, me and the sun in a line) a couple of times while he hunted across the field. There was a lot of preening, listening and looking around (and the occasional glance my way) in between the three flights he made while I was there. 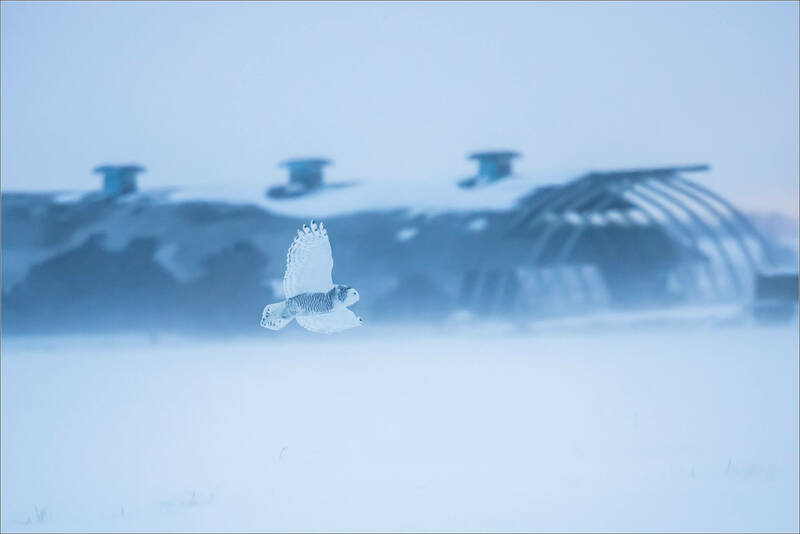 He flew back to the road, and directly past me, on the first flight and landed where a slight rise afforded a view in both directions. He stayed pretty alert and it did not take very long before a target was found. 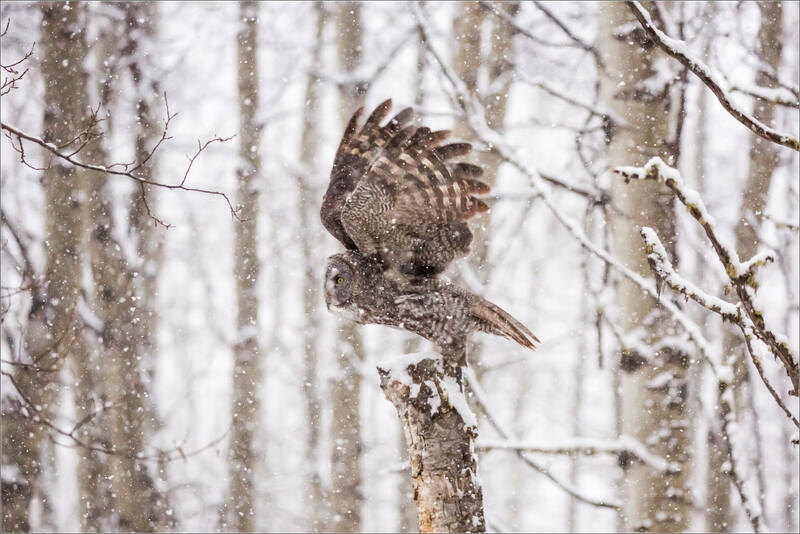 The owl flew a very short distance and then dropped on the far side of the road. 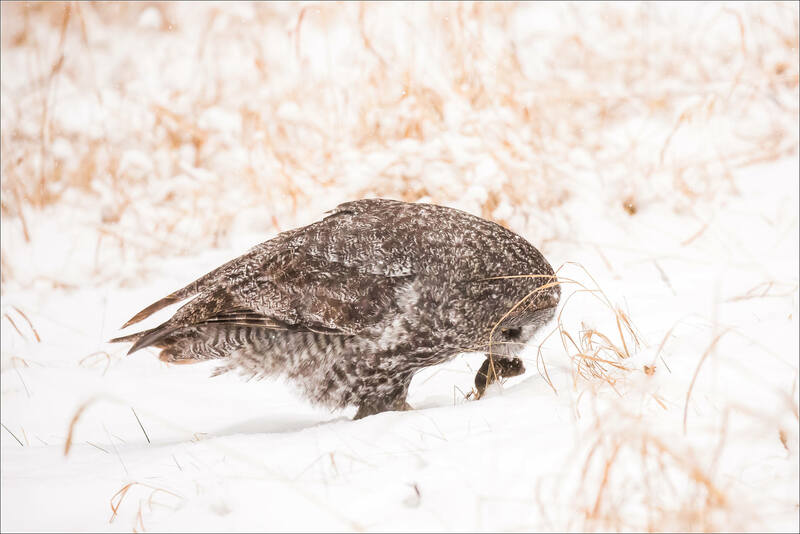 He grabbed a small mouse that was beneath the snow but not safe from this accomplished hunter. He finished second breakfast and flew back close to the roadside perch. The light was amazing and lit up the golden eyes. 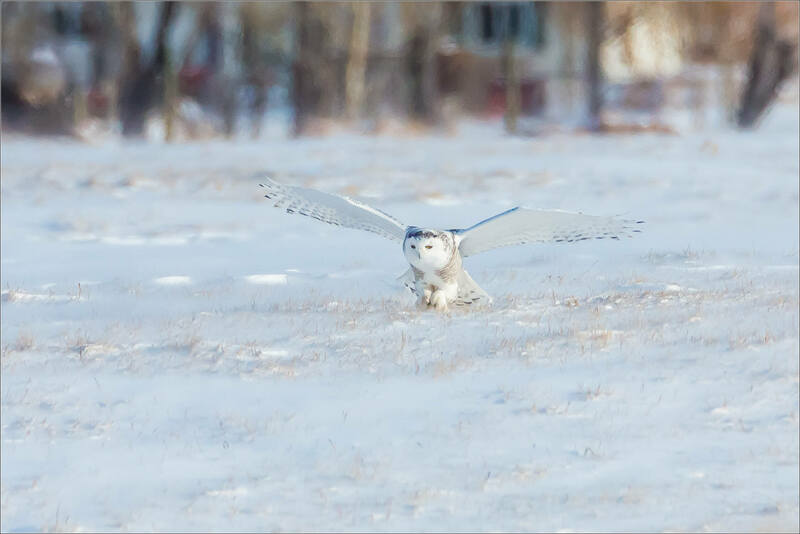 More than an hour later he flew across the field away from me and I headed home. 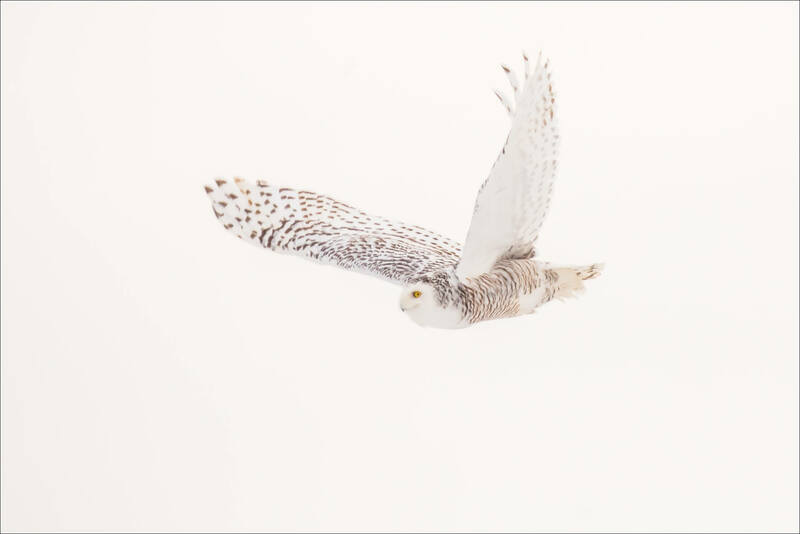 The photograph above of the snowy owl in flight was taken late in the morning on February 11th. This flight followed a long wait after some good early action. The wait started with a feather cleaning session on an entrance gate which was interrupted by the approach of this truck which prompted the bird to fly to a more isolated spot. 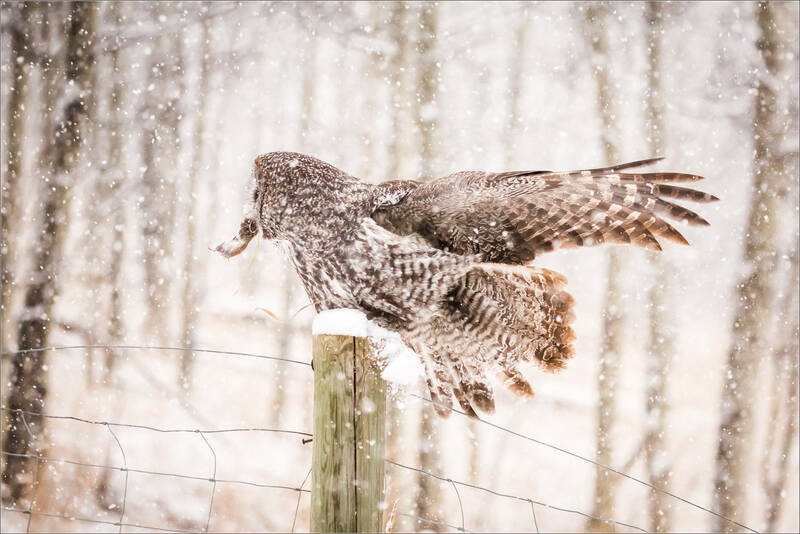 When the vehicle drew too close for the owl’s liking, she launched and flew along the fence line towards the sun. 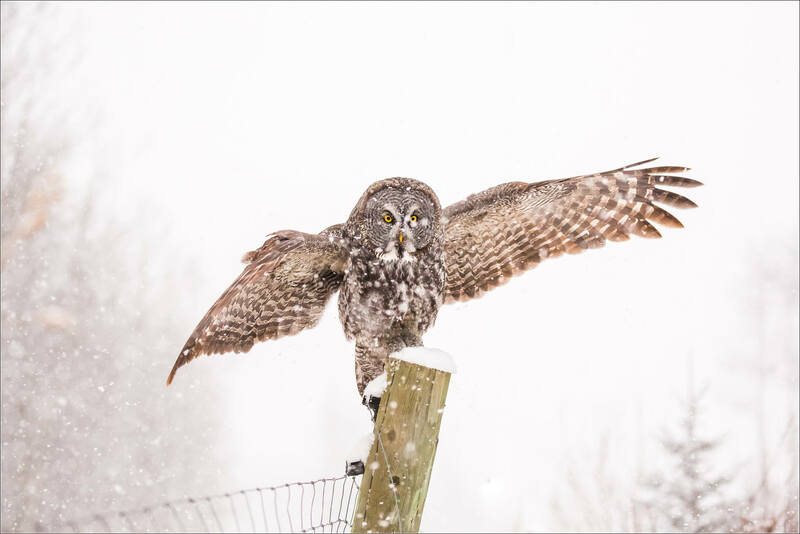 She didn’t go too far – landing on a post roughly 100 metres away. 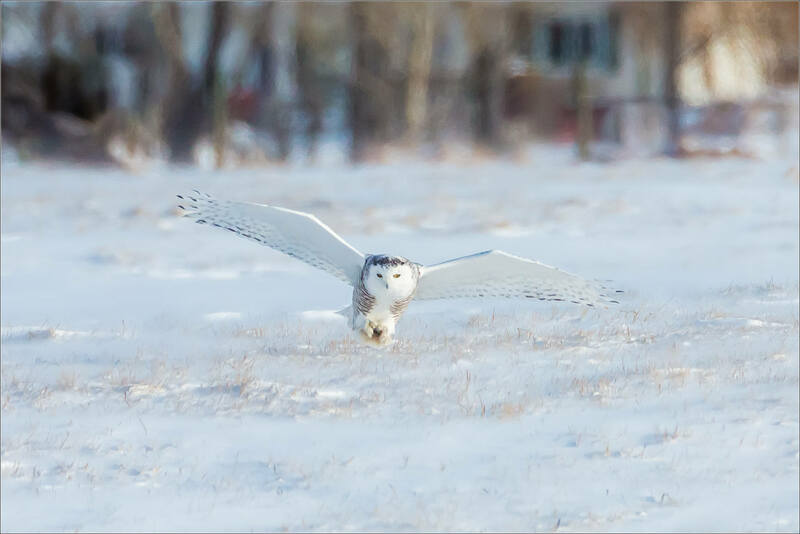 We were separated from the owl by a fence line of our own which ran parallel to hers and they were about 80 metres apart. That distance was just fine for me and with a 500mm lens made the subject a reasonable size in the frame. From where I was, the sun angle and the background were both far from ideal. I walked along the fence line and found a new location which allowed for improvements in both areas. I kept moving around now and then to change the scene. 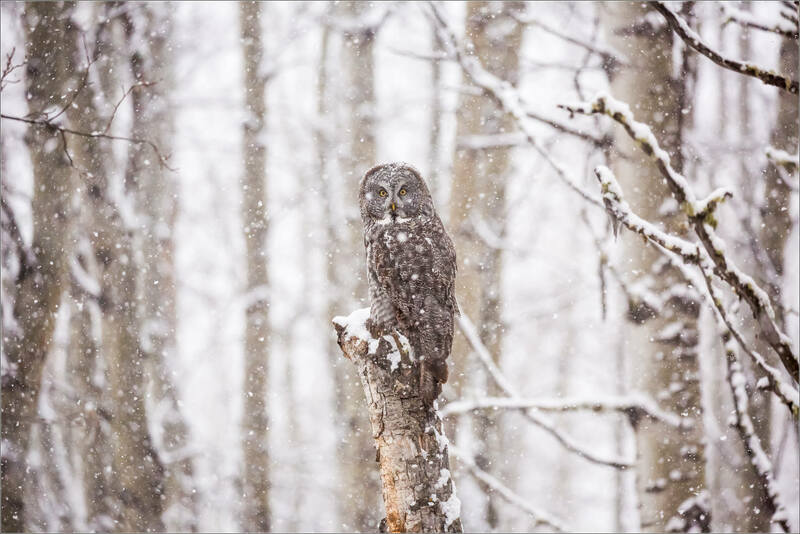 The owl did not – she settled in and did not leave the post for a long time. There was no way to know at that point, but it would be 2 hours and 38 minutes before the snowy would return to the air. The potential for a special moment – maybe a dive close to our line or a flight with the sunlight catching her eyes – kept eyes glued on her and fingers resting on the shutter buttons. 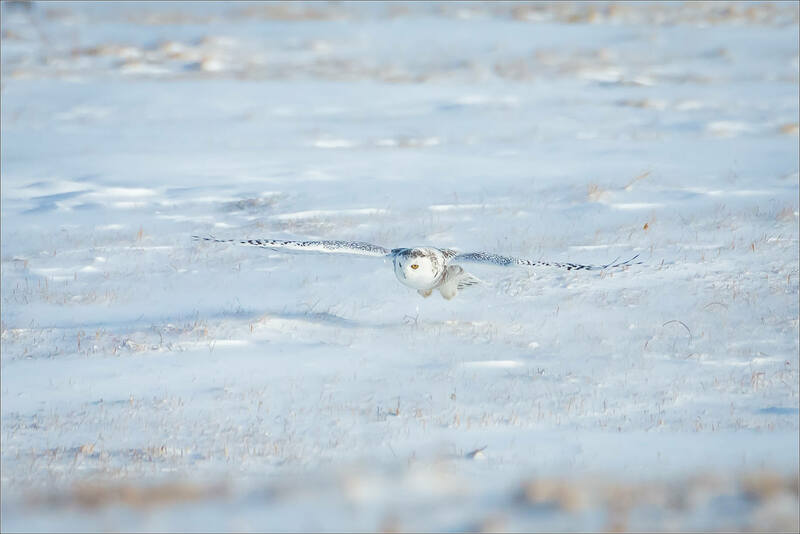 At a few different points, a drift of snow buntings buzzed past the owl as they flew to different spots around the field to forage. 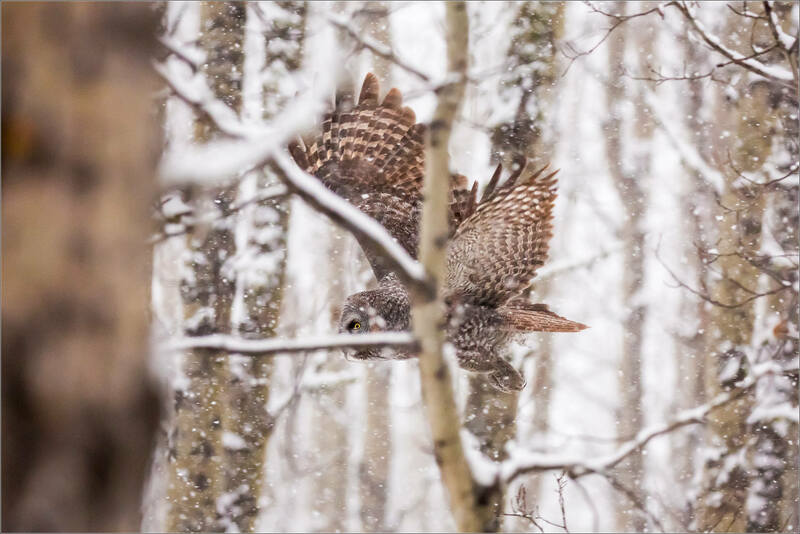 For her part, the owl watched these comings and goings with minimal interest. For me, these sorties were welcome bits of action. Along the way there was more preening, dozing and the occasional stretch. The one below seemed like a yoga position and was one that she held for several seconds. Maybe this was all a part of her morning meditation? 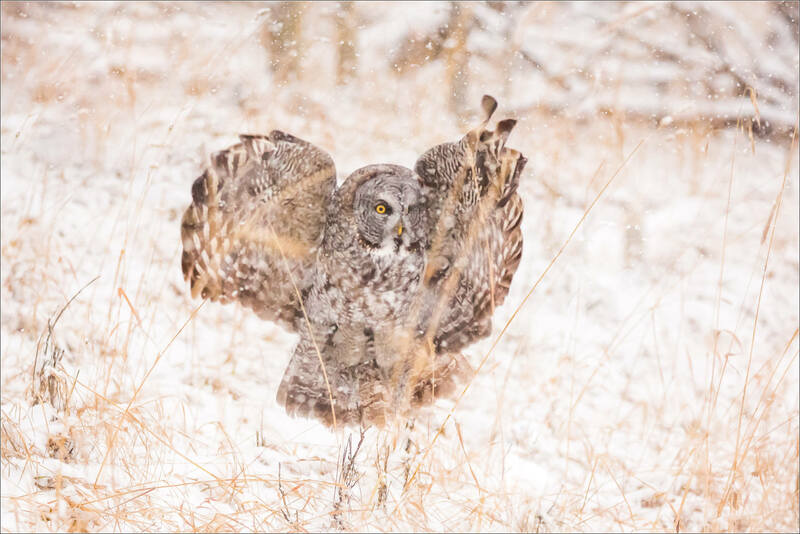 Just before noon, the wings opened and she pulled her body down into a crouch. She paused for a second and then pushed off into the air. 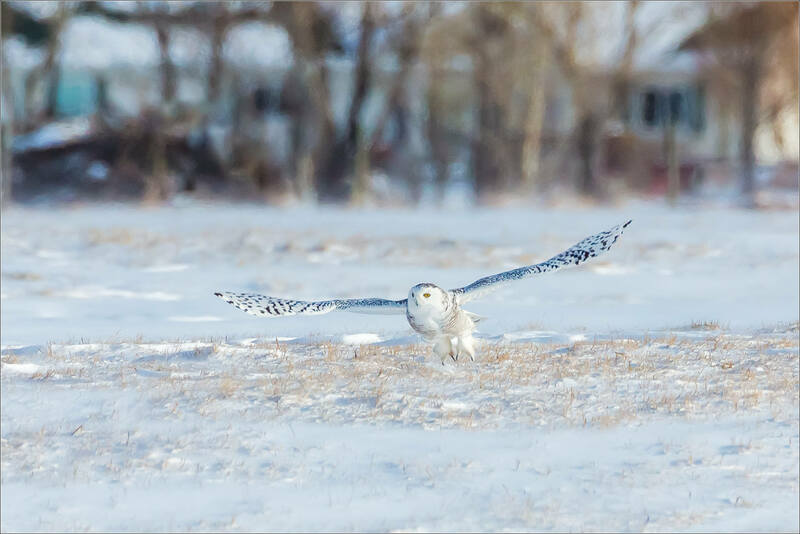 The snowy flew along her fence line which allowed for a few nice photographs before she passed us, crossed the road and landed in the snow near the top of a small rise that was a couple of hundred metres away. My fingers were aching from the cold so this was one of the rare times where I was no longer interested in continuing to shoot. I was happy to get in the truck and get the heat going. 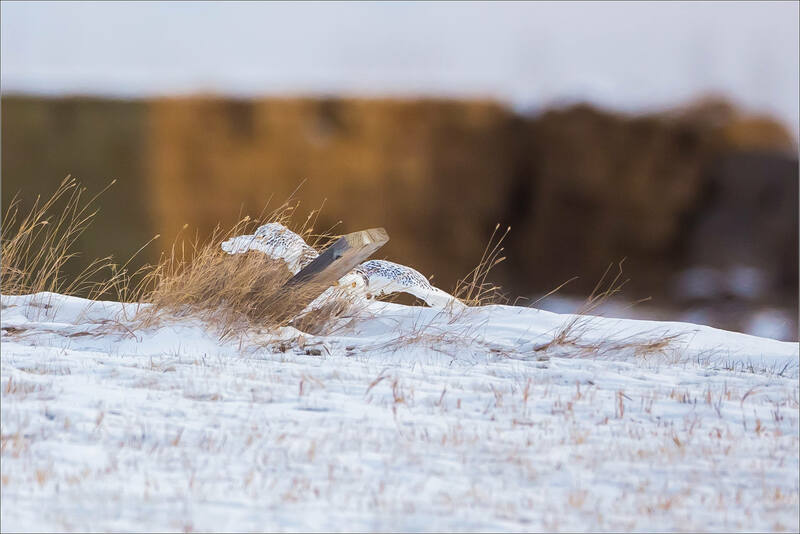 Just before New Year’s Eve, I headed east and ended up spending all of the daylight hours on the prairies. 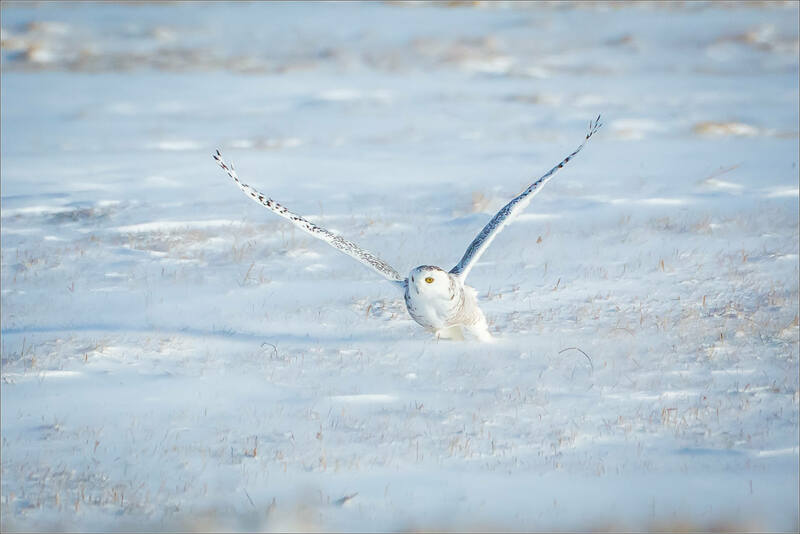 During the day I came across three Snowy owls in separate locations. 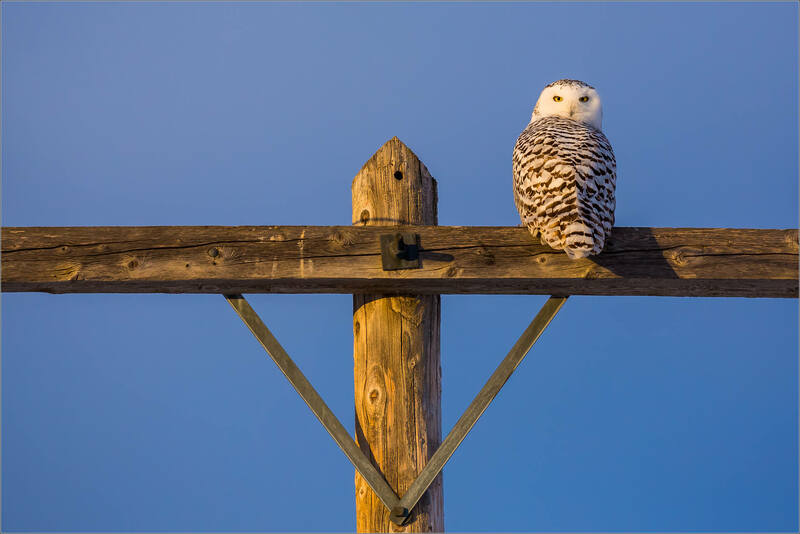 The first was perched on a telephone pole keeping an eye on the coming dawn and the snow below. She flew in front of me when a loud truck passed by which afforded me a great angle to photograph her. 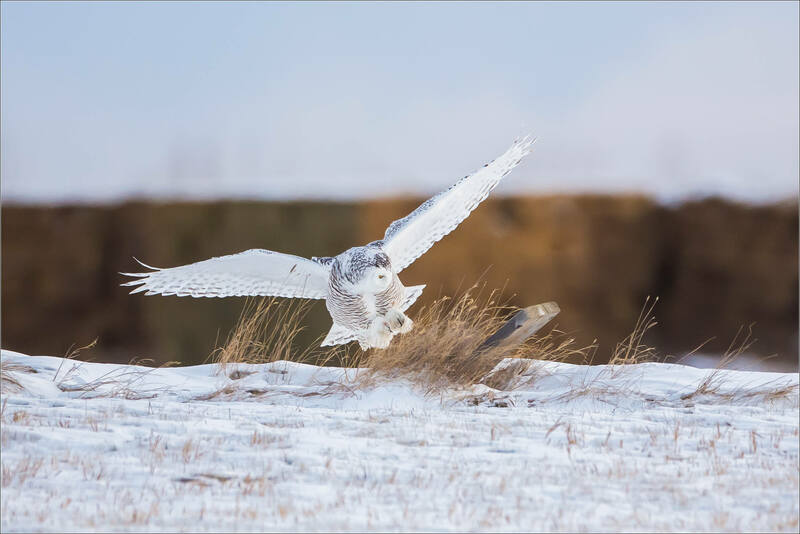 She glided to a fence post in the middle of a nearby field. On her way she crossed the eastern sky which framed her wonderfully. 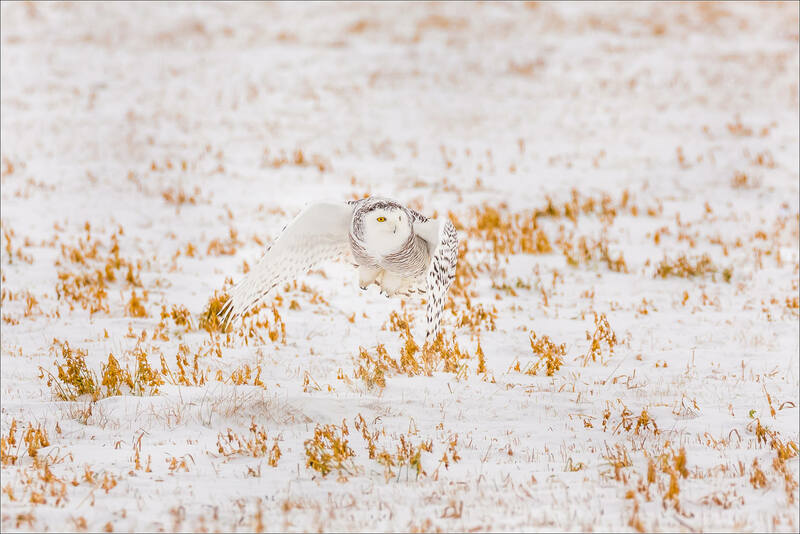 With a great start now in hand, I carried on and ended up returning to the field where I have been fortunate to photograph one Snowy a few times (one, two, three and four) already this winter. 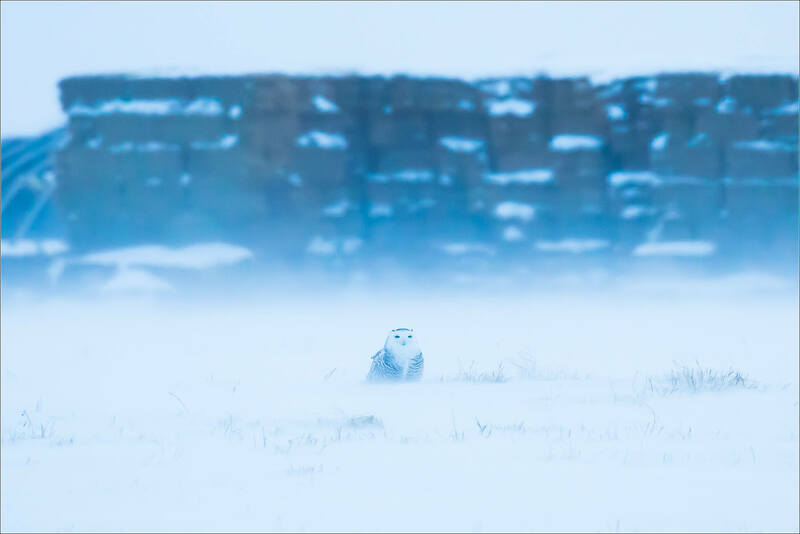 I found that owl about an hour after sunrise. 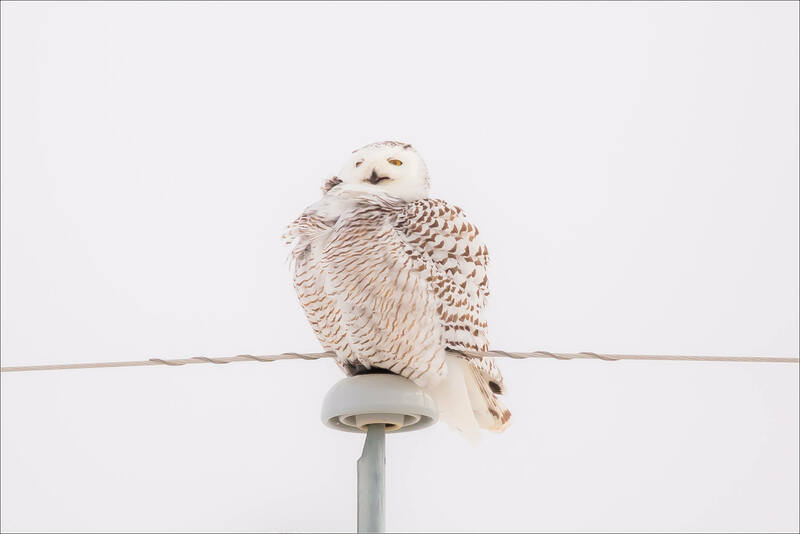 She was comfortably resting on another telephone pole. I say comfortably because she stayed in the same spot for the next 85 minutes. Happily for me, it was not the deep freeze we have had regularly so far this winter so I was relatively comfortable while I waited. A couple more hours went by after that, punctuated by three flights between high points around the field. That’s a lot of waiting for a little action but I don’t mind. I certainly have a lot of time to let my mind wander and to think about things at length – a luxury these days. 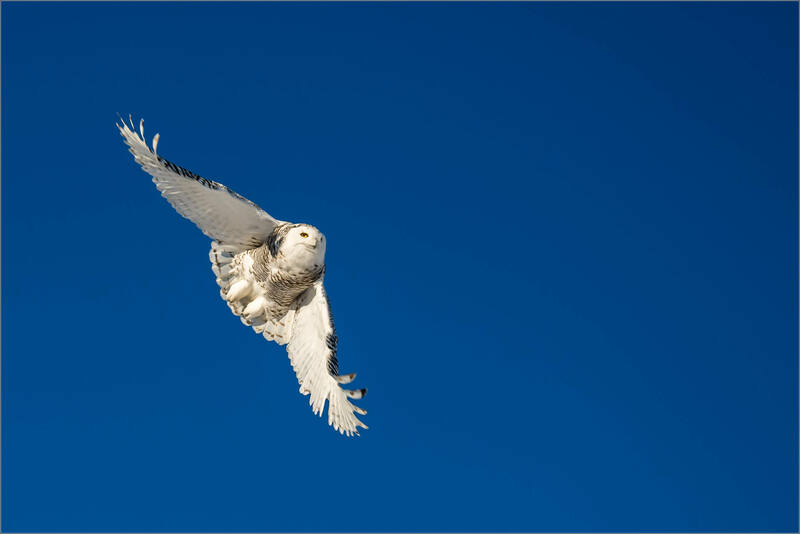 And, when the launch occurs, I love watching Snowy owls in flight. Especially when they are framed against a clear blue sky. 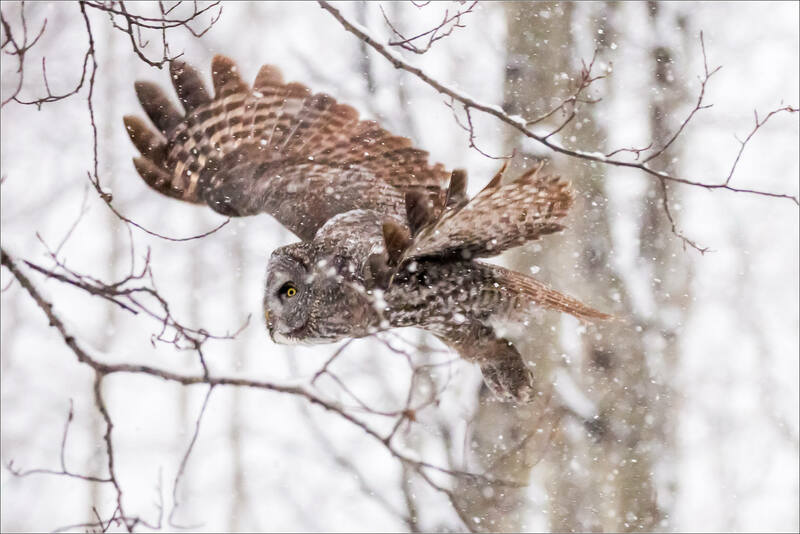 I hope for a look from the owl during these flights – eye contact makes for more compelling images but often that doesn’t happen as they fly in the wrong direction or have their eyes focused on something else. Look or no look, I enjoy watching and click when I see an interesting wing angle, body position or something else that seems interesting to me. The days are short at this time of the year so it felt like late afternoon came quickly. 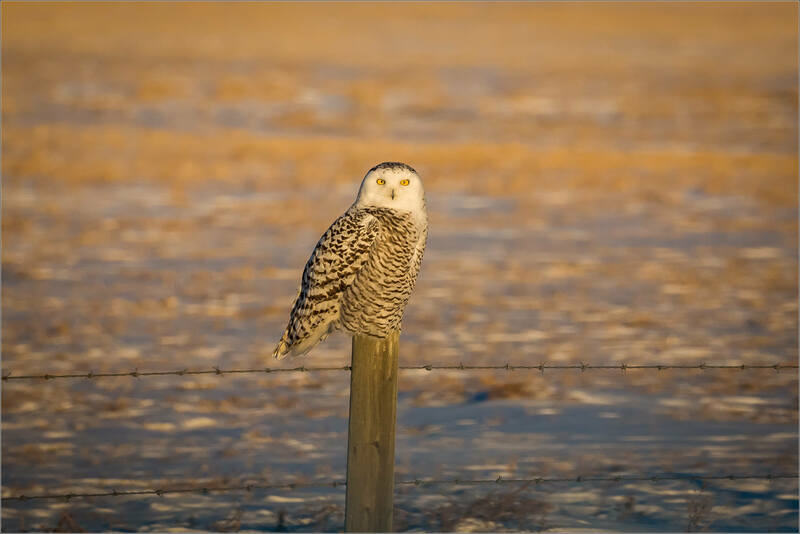 Along with it came some wonderful light and I found the third owl perched on a fence post a mile or so from the other Snowy. I do not think I have seen this one before and she stared intently at me for a minute like I was a stranger. 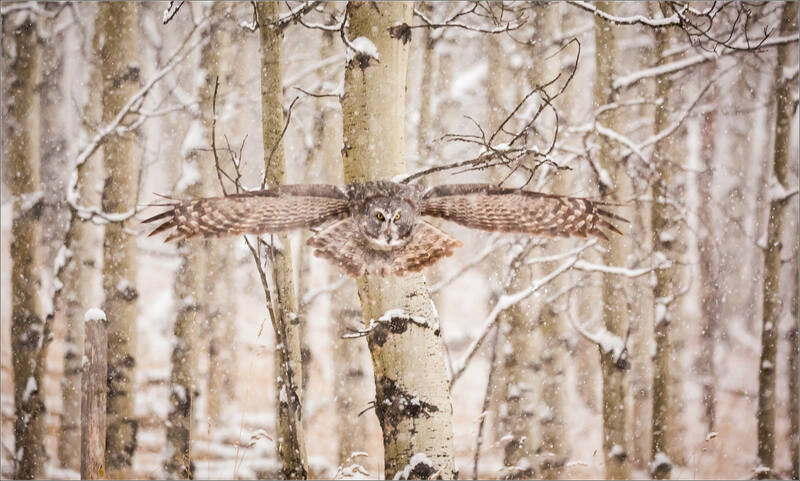 Then she went back to scanning the field behind her in the image above. 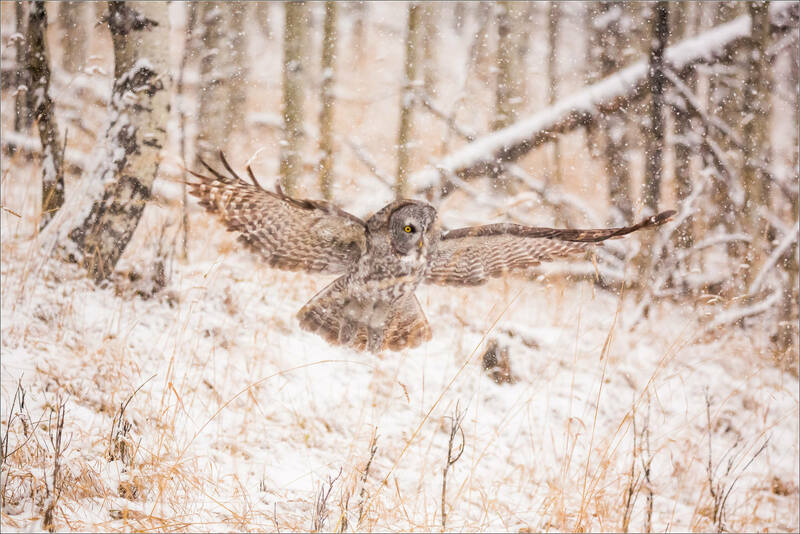 Soon after she flew, glided across the field, caught something in the snow and flew up to tree to dine. That all happened far away from me so I carried on to try to take advantage of the warm sunlight. I didn’t find anything else before the sun went down but enjoyed watching the color rise up into the sky. 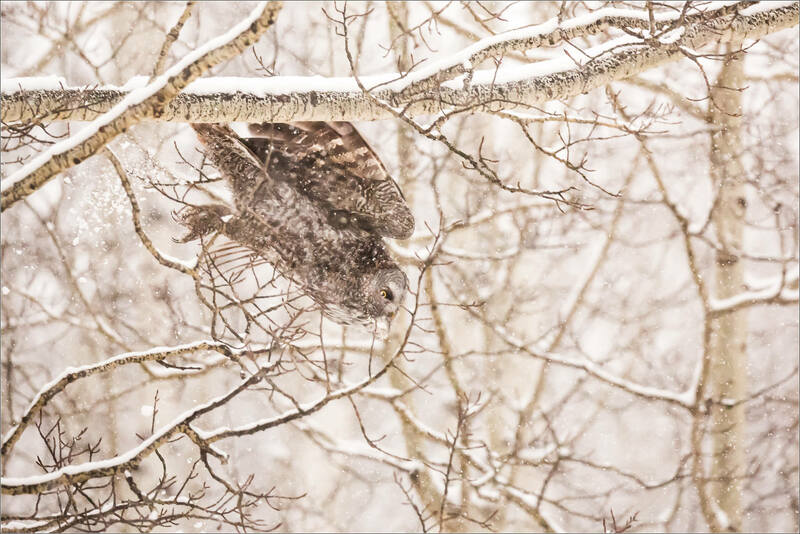 Eventually I returned past the last owl’s field and now she was perched in a tree closer to the road. I got out hoping to photograph her silhouette against the sunset. 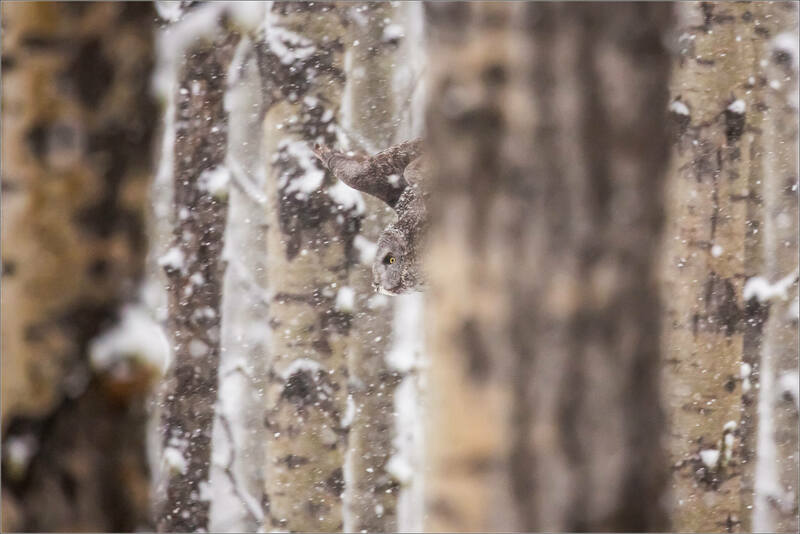 Her profile in the tree was not great from my position so I waited to see if something would fall into place. 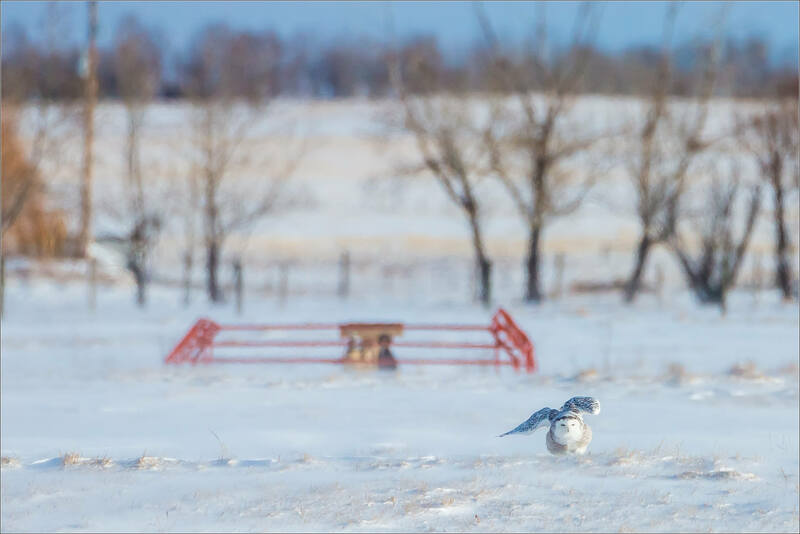 After a little bit she leaned forward and then dropped off her perch to fly over the field. 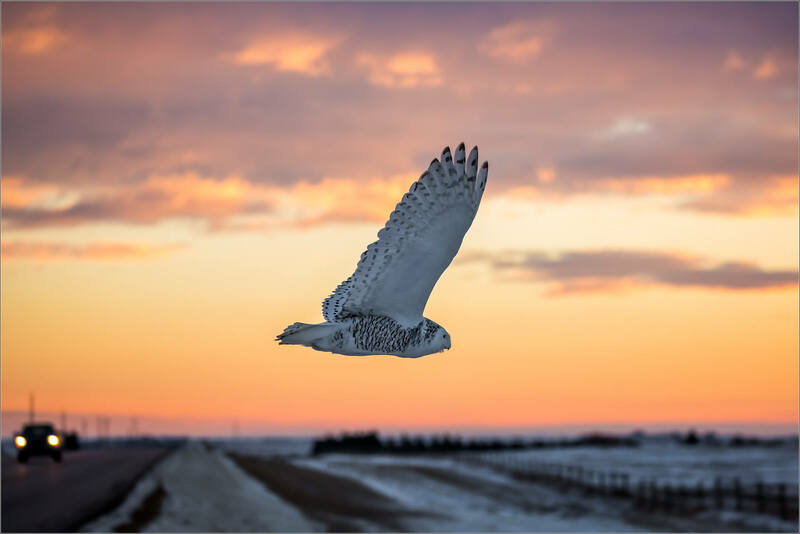 That was my last photograph of the owls and tied off a pretty good day on the prairies. 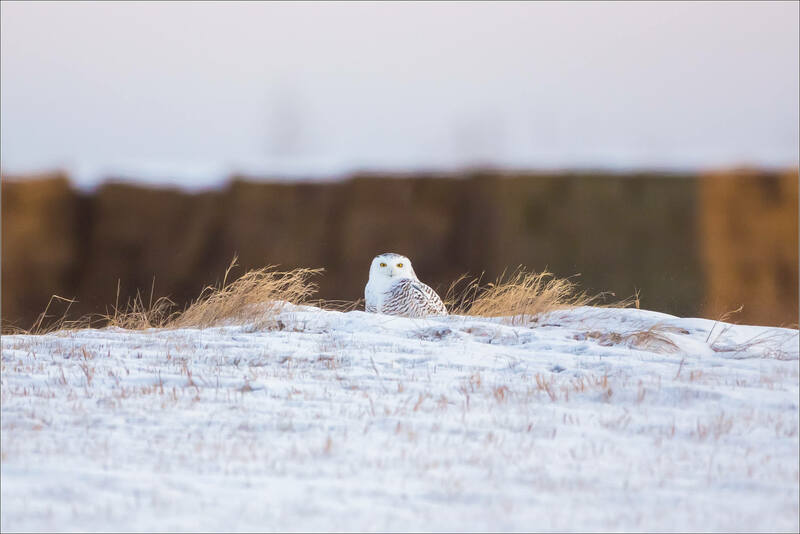 After a blustery start to the day on December 27th, by 2pm the wind had settled down and the sun then came out making for a much more comfortable time while I watched this Snowy owl. She seemed to enjoy the change in the weather too as she was very active. 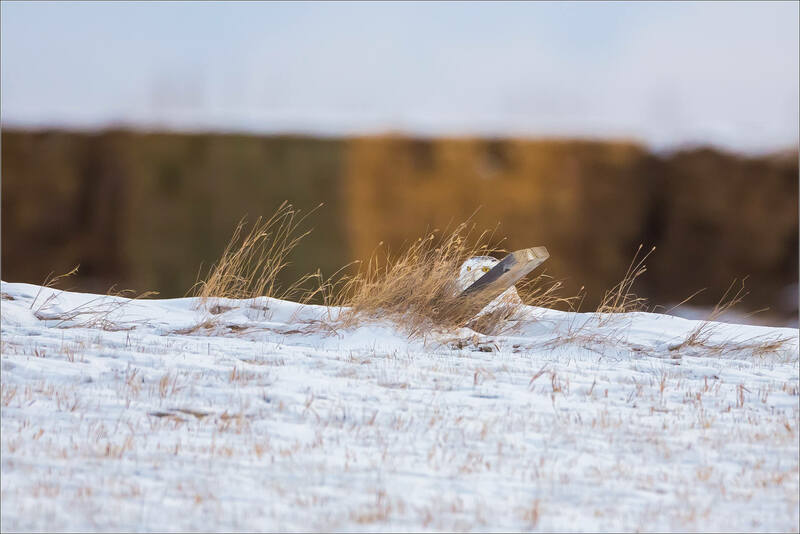 Her hunting ability is exceptional and she caught a mouse on almost every glide low over the snow. 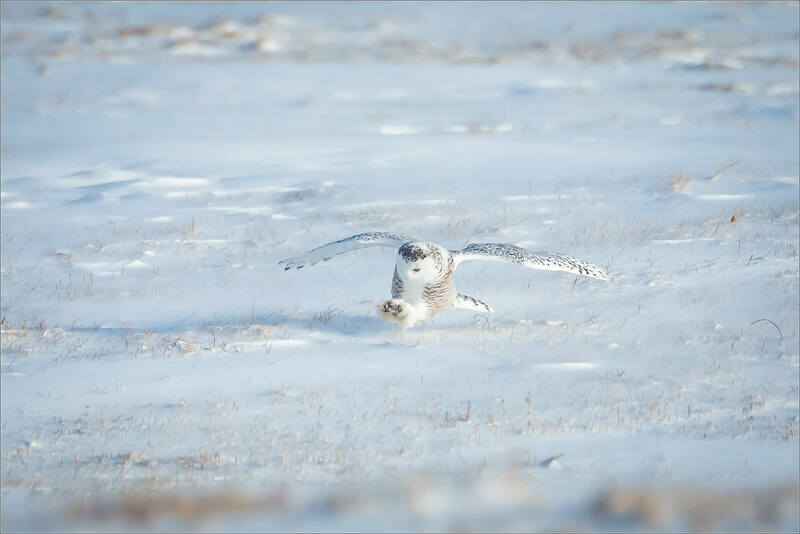 The two series, above and below, were both successful hunting runs where she caught a field mouse or something similar. 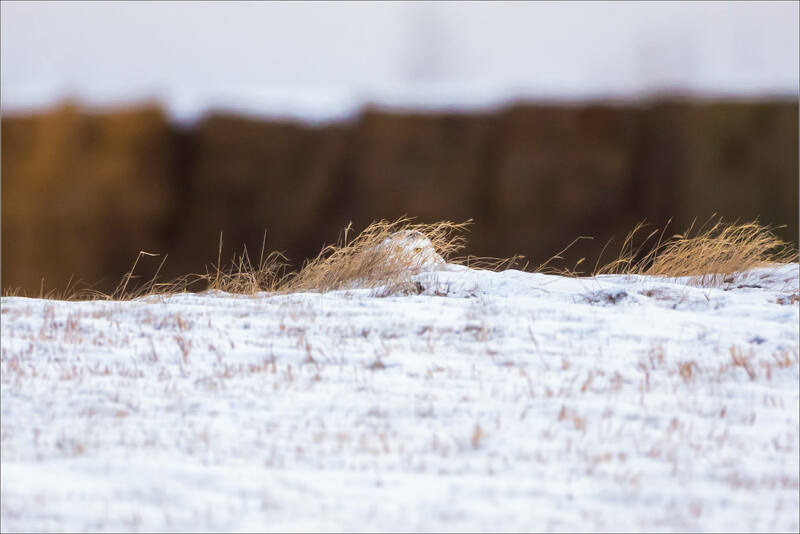 I have become a regular observer of this bird in particular as she has a large farm field staked as her territory and I’ve been lucky to find her there consistently. 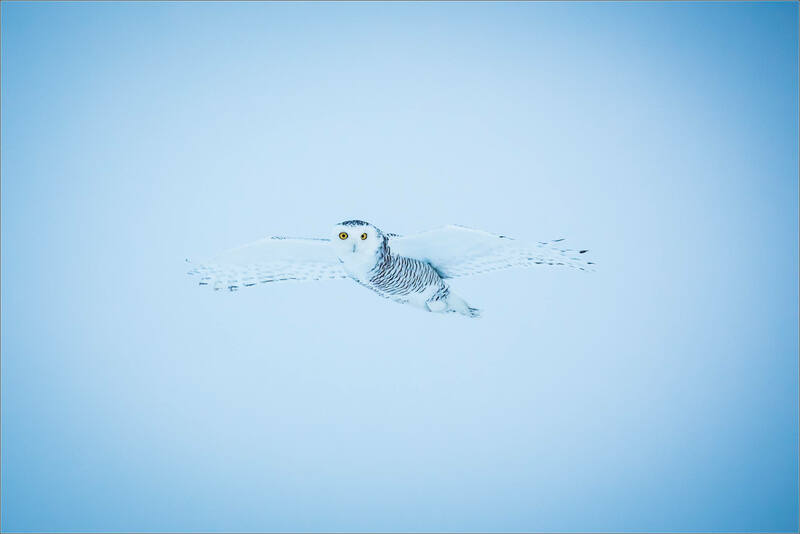 In previous years, I have occasionally been able to repeat time with the same owl but this regularity is really special to me. 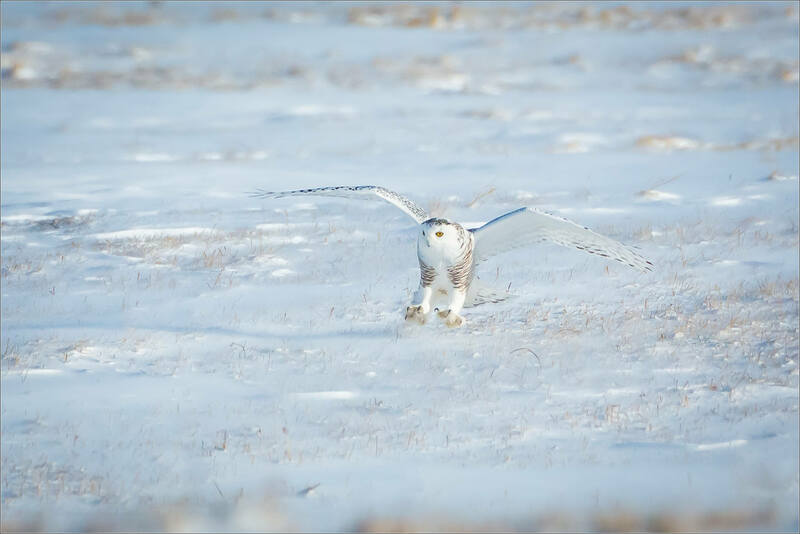 Earlier she flew to a few different parts of the field before settling on the area where she flew over in the photographs above. 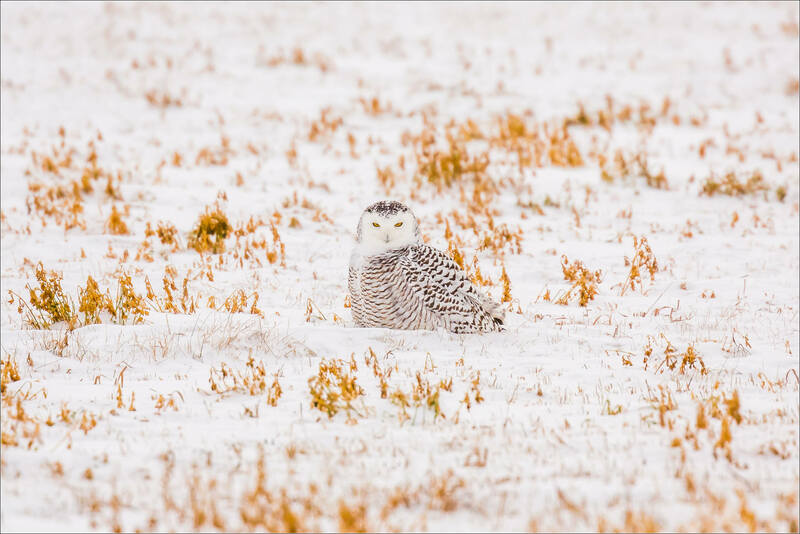 A couple of weeks ago I went out on the prairie looking for Snowy owls. 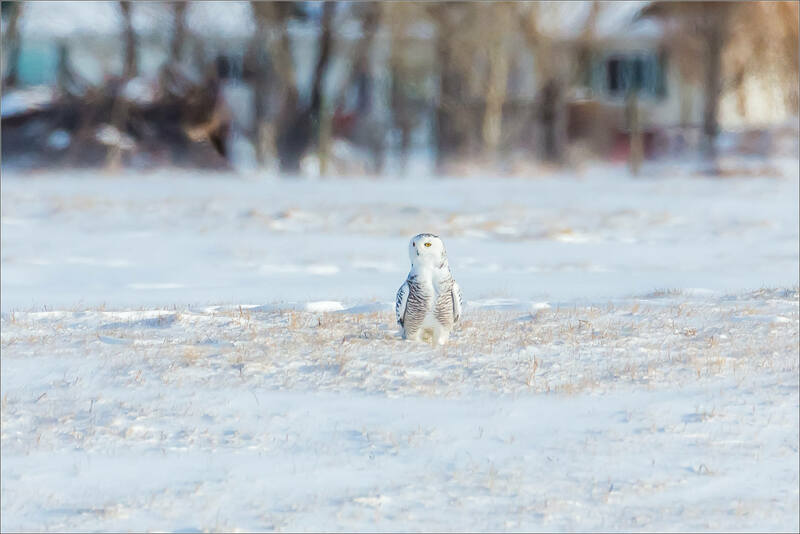 North of Langdon, I found this owl in a familiar locale. 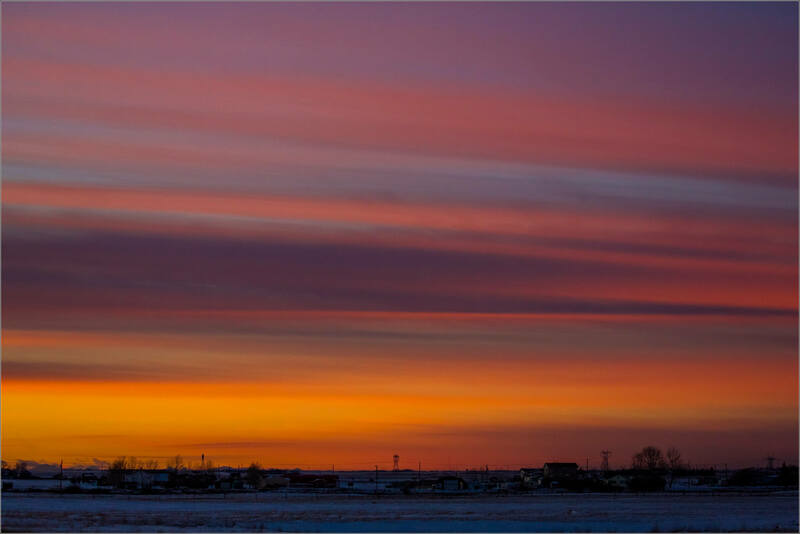 It was a cold, blustery wind that accompanied the sunrise. The snow blew into the air throughout the morning and made it feel like we were much closer to the Arctic Circle. It was pretty dark with a bluish cast in the morning which only added to the wintry feel. 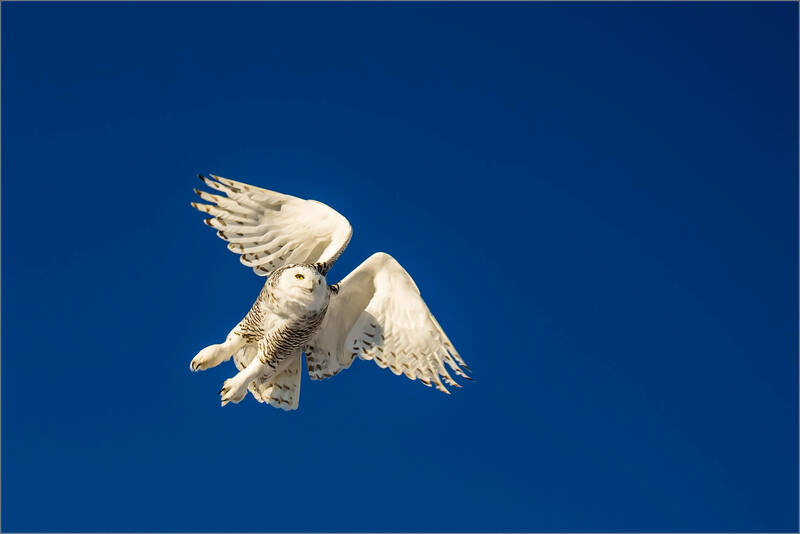 At one point, the owl flew directly overhead and then around me which was a highlight for sure. 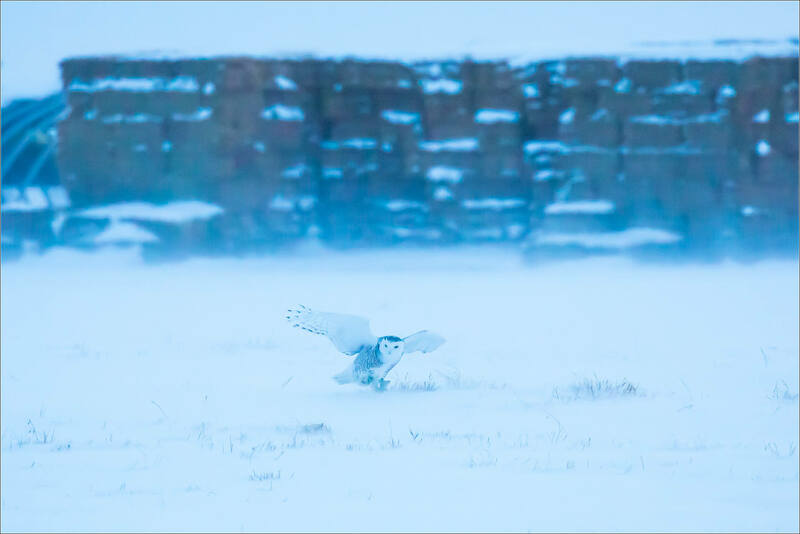 The rest of the morning was spent watching the owl sitting with making the odd hop/flight around the field. 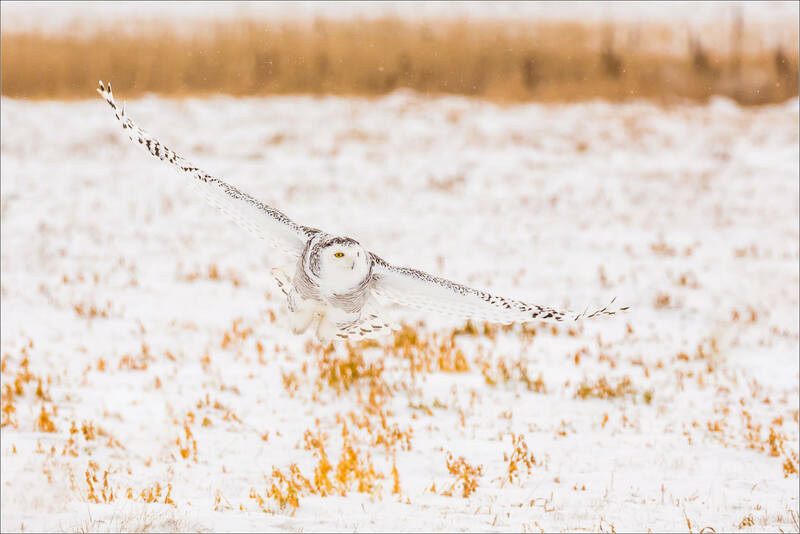 Another good morning with this Snowy owl. 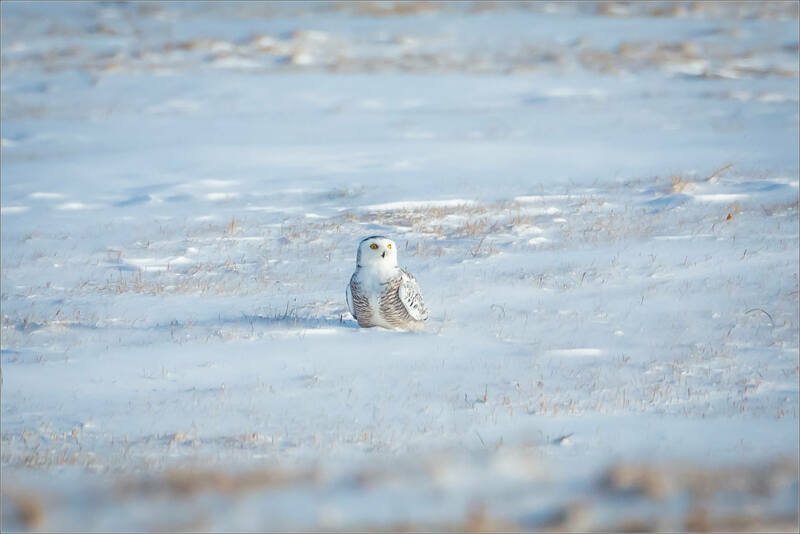 The Snowy owl that I had photographed the previous week, I found again last Sunday. 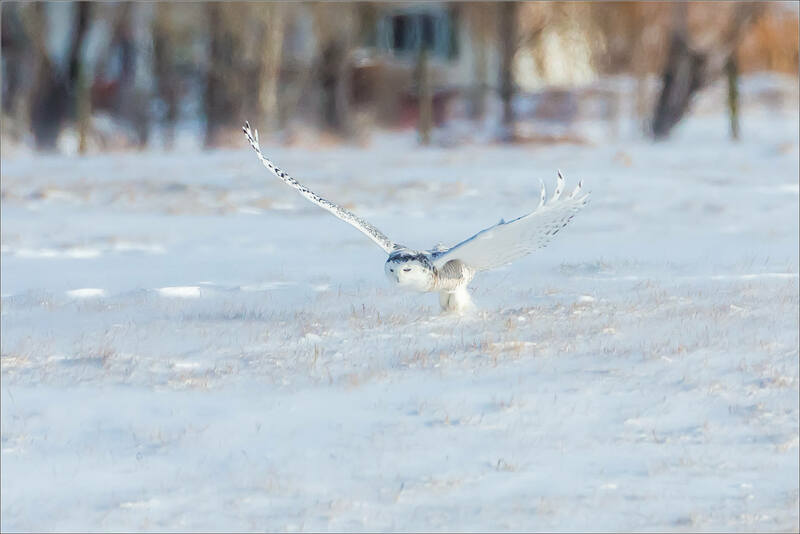 This time she was on a snow-covered rise ~50 metres from the fence line. It was much warmer than the week before and the sun was out so it was quite a pleasant visit. 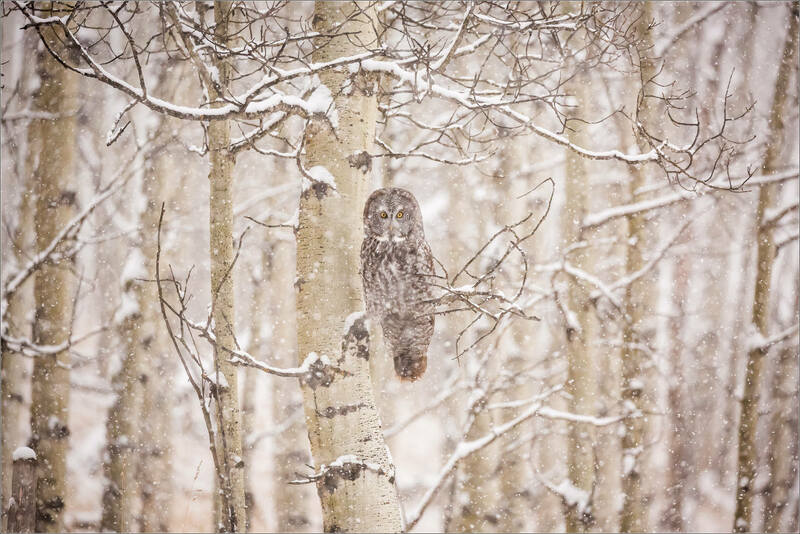 The owl perched taking in a complete view of her surroundings – me included. 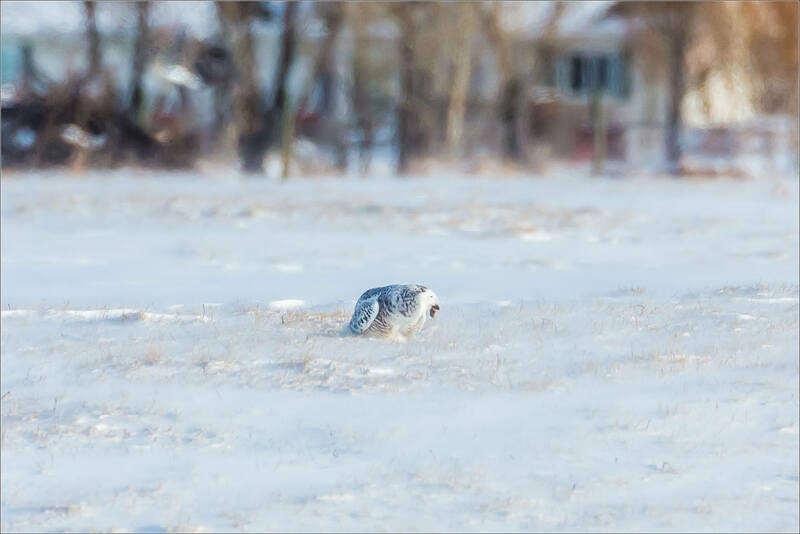 The wind was gusting ahead of a chinook that was arching across the prairies so she crouched low whenever it picked up. 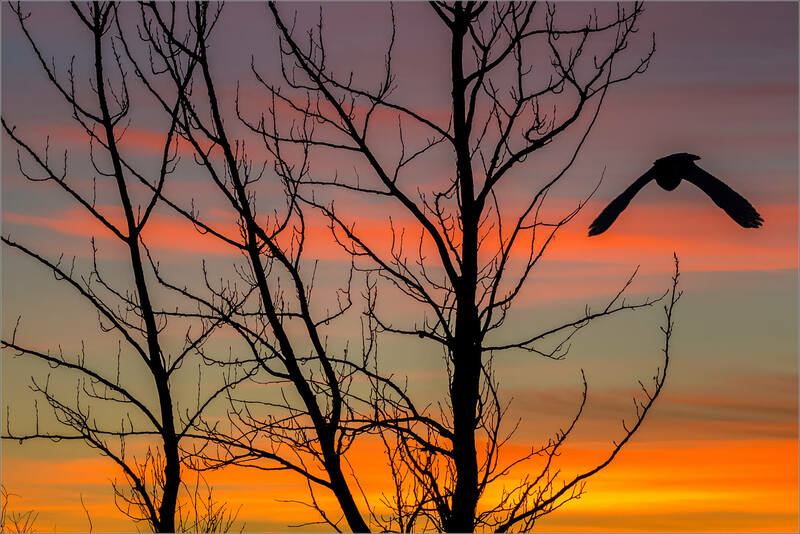 In between one of the wind blasts, she caught sight or sound of something to her left and glided towards a broken post. She hovered for a moment and then dropped to the ground. She grabbed something and quickly swallowed it. She landed a little further behind the rise and in line with the post so I missed a clear line on the hunt’s conclusion. She soon returned to scanning the field. And I found another sight line. 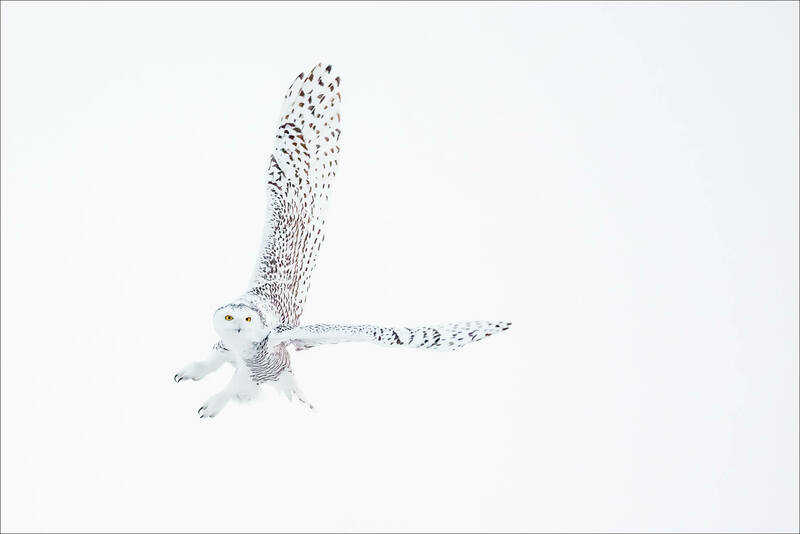 First Snowy owl of the season! 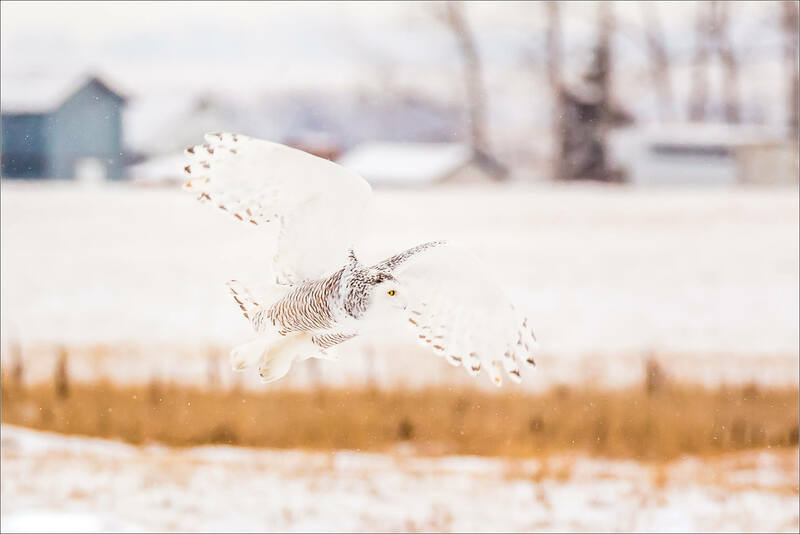 For the past couple of years, every November I start getting excited to see Snowy owls. 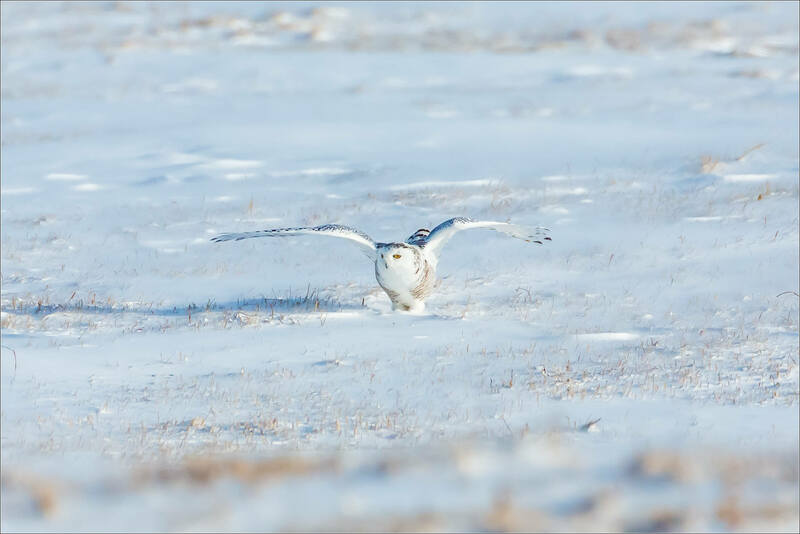 That is the time that they start to return to southern Alberta after their summer nesting season in the Arctic. 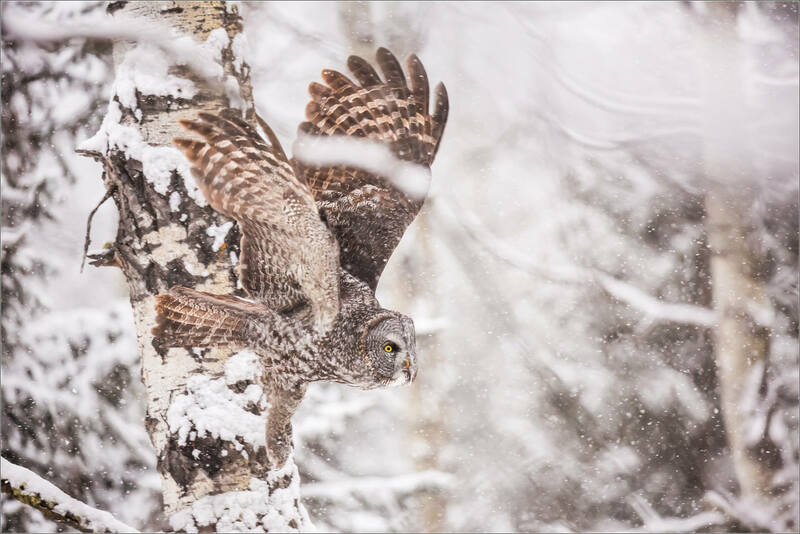 This year, Great gray owls and mountain landscapes kept me away from the Prairies until December. 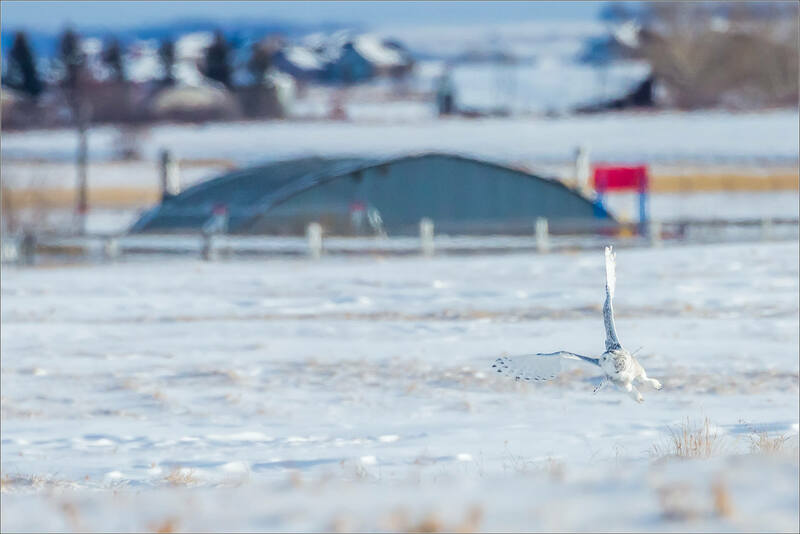 When I head out to the open fields east of Calgary, I crossed paths with three separate Snowies and a Red fox – truly a windfall of good fortune! 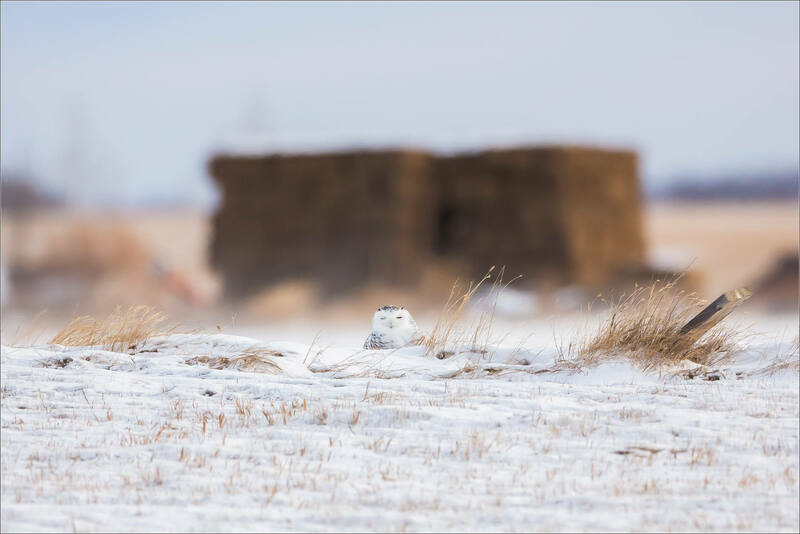 The first Snowy owl was perched on a telephone pole overlooking a farm field where the fox was hunting. She was content to swivel her head around to keep eyes on everything around but not very excited by me, the traffic passing by, the farm dog that barked now and again at the fox nor the fox herself. So relaxed, that she stayed put for almost two hours. It was -22°C and the wind made it feel cooler than that. I couldn’t blame her for not moving around too much but it was quite a while to wait. I maneuvered my car to the far side of the road so that I could keep a lens on her from my seat and waited. 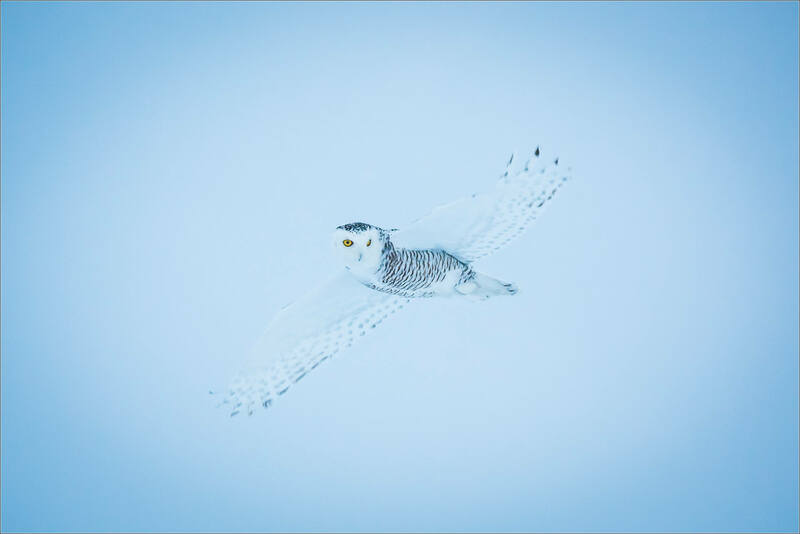 The light flattened out and the clouds formed a white sheet behind her but I didn’t mind too much – I was happy to spend time with my first Snowy this winter! 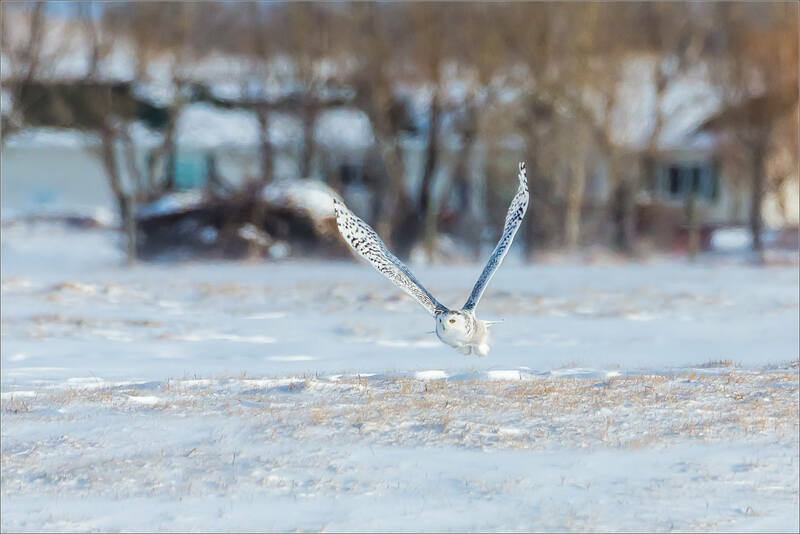 When she did launch off the pole, it was to glide down to the field. 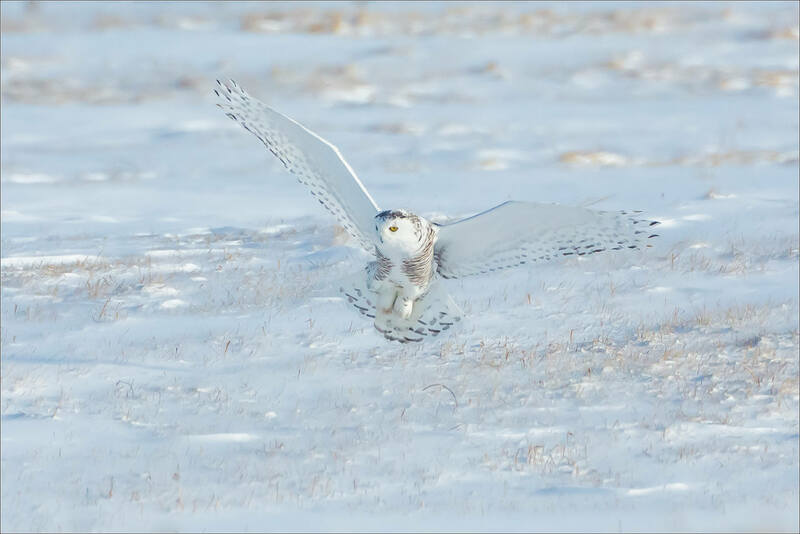 She skimmed low over the snow and grass before disappearing behind a small rise. 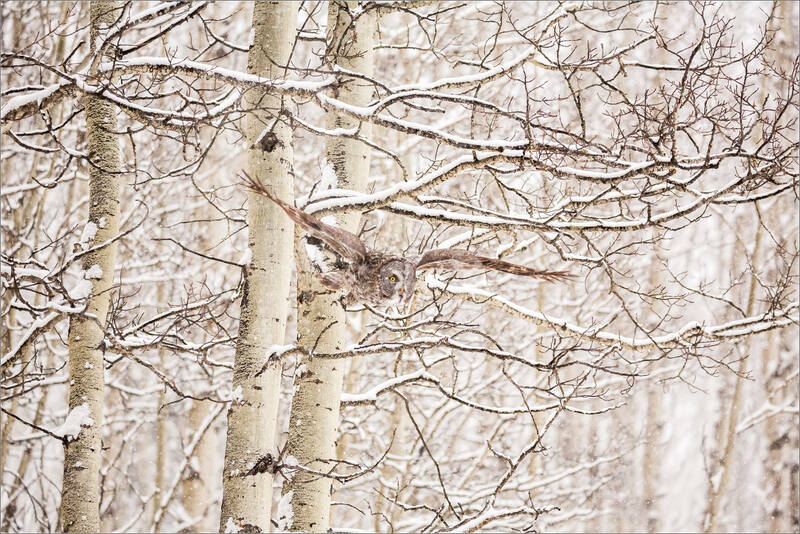 I hopped out and walked along the fence to a vantage point where I could see the owl again. She looked like she was preening after eating a mouse but I didn’t see the attack if it did happen. She sat and watched some more, staring at me lazily a couple of times – and once with the focused laser beams as seen above! After a few minutes, she stood up and quickly took flight again. 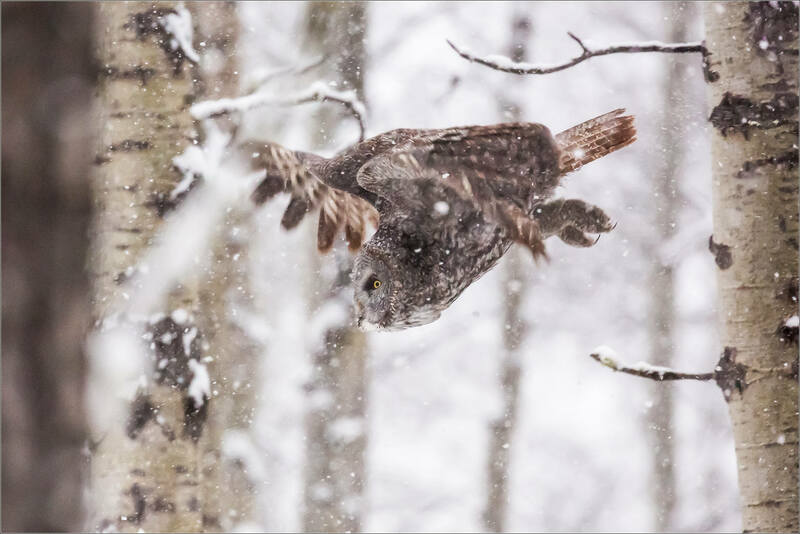 I love watching owls take off – they have strong wingbeats that have a clipped range of motion which seems effective to get them into the air fast. 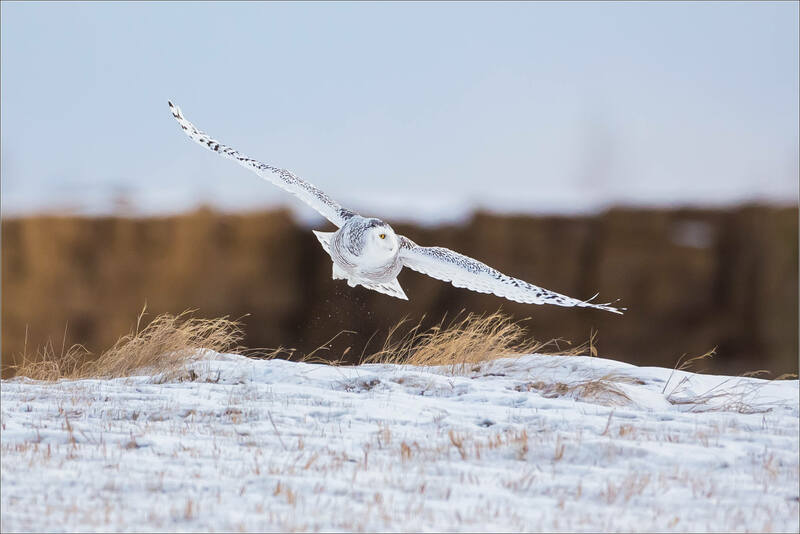 The Snowy owls, along with the Great horned owls, are enormous as far as North American owls go so it is impressive how much power they generate. 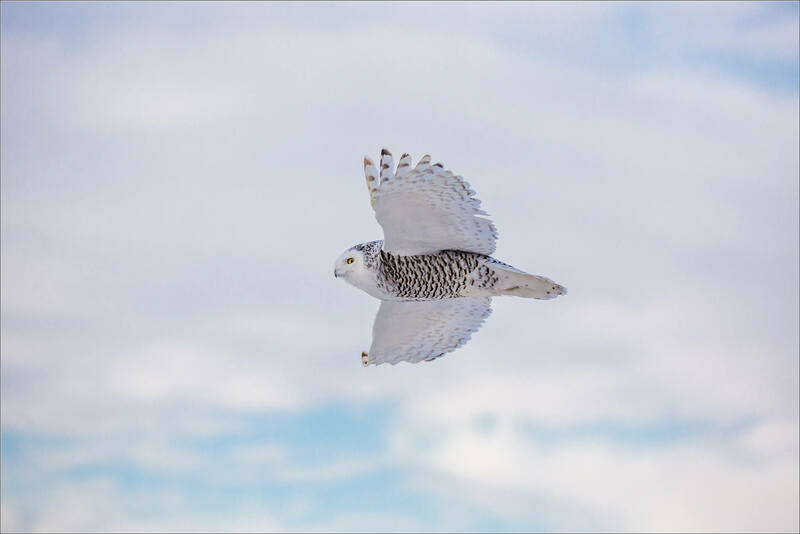 She flapped hard and then levelled off about 2-3 metres off the ground as she retraced her flight plan back towards the road. 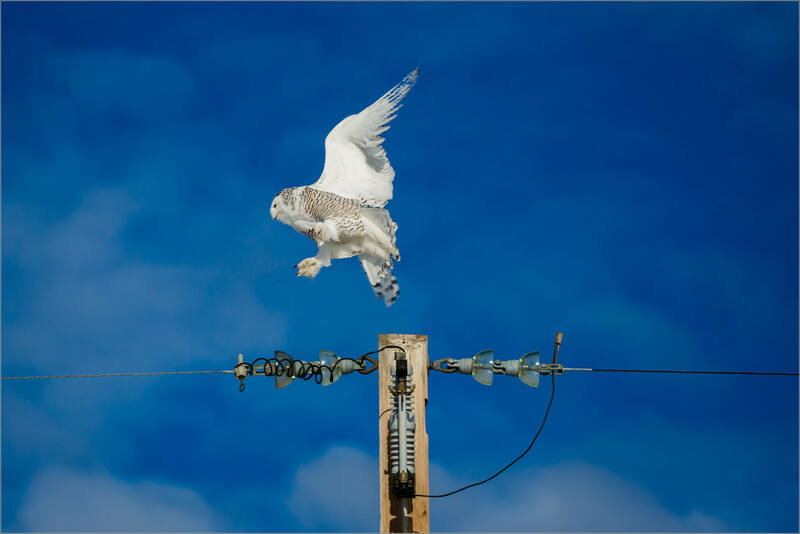 Near the fence line she climbed up to perch on a new telephone pole’s insulator. 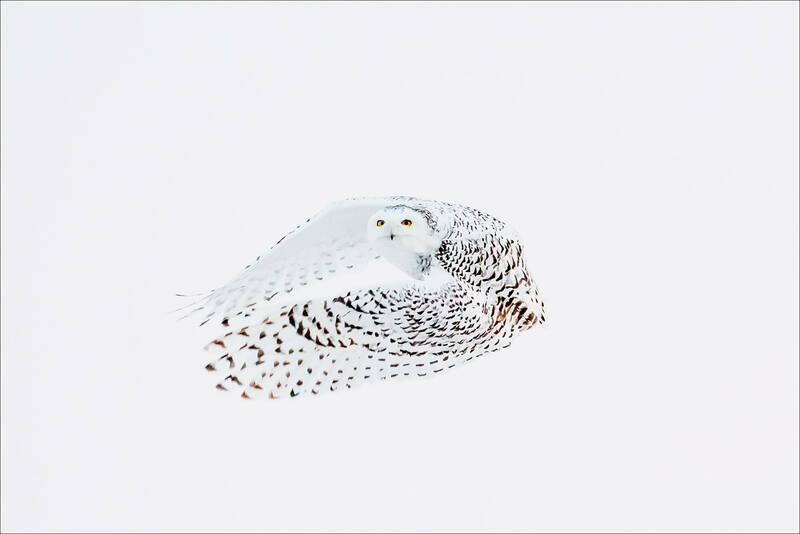 Once settled, she puffed up her feathers – the one acknowledgement to the cold I saw from her this time out.